This beautiful toddler girls’ hoodie cardigan is very easy to crochet and makes a lovely addition to any little girl’s wardrobe. The pattern is all worked in double crochet. 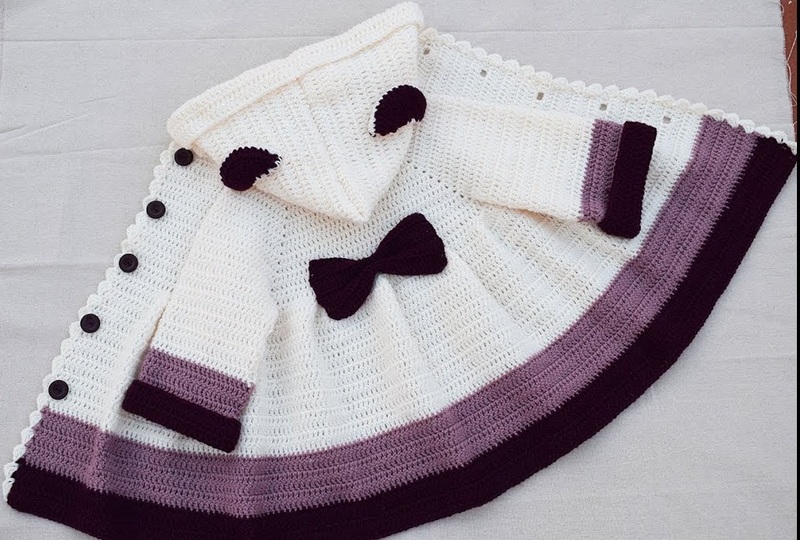 The featured crocheted coat for little girls is worked with 4mm wool and 3,5mm hook. The size is for a 4 year old girl. But you can make the size you want. It works with 4 mm wool and 3.5 mm hook. Is there a written pattern? please provide a written / printable pattern. i have tried to follow but i am much better at having a written pattern. i would really like to me this. I agree, the link is not there. Really was excited to make this for my granddaughter, feels li,e it’s just click bait of some sort. Nana, please read below the video: “The pattern is written on the video, step by step, so all you need to do is to start playing the video and follow along. Due to the copyright reasons we cannot help you with having the complete video pattern put together on our website. <3" Thanks! Could you please tell me what 4mm wool is? Or how do I convert that into PLY? This is so beautiful and easy to make. I am making one for a 6 year old and a 6 month old. Just changing yarn and hook sizes. I love it so much. Thank you for making it in English. I am trying to make this for a 2 yr old child. How do I determine the amount of starting chains?